Located on the NSW Central Coast in Greater Sydney, the Hawkesbury-Nepean catchment is one of the largest coastal basins in NSW. With an area of 21,400 square kilometres, over 70 per cent of the catchment consists of mountainous terrain, with about 10 per cent of flat terrain. The south terrain, around 10 per cent of the total catchment, comprises undulating plateau type country. The maximum elevation is about 1,290 metres. The catchment includes the coastal reaches from Turimetta Headland to Barrenjoey near its mouth, and catchments for Warragamba, the Upper Nepean and the Mangrove Creek dams, the main water supply reservoirs for the Sydney metropolitan area, including Gosford and Wyong. Penrith, Gosford, Goulburn, Camden, Katoomba, Lithgow, Richmond, Windsor, Moss Vale, Mittagong and Bowral. The main rivers and tributaries include the Hawkesbury-Nepean, Avon, Cataract, Colo, Cordeaux, Coxs, Grose, McDonald, Wollondilly, Warragamba and Wingecarribee rivers. There are also a significant number of creeks including Berowra, Bundanoon, Cascade, Cattai, Cowan, Mangrove, Sooley, South and Mooni Mooni creeks. View real-time data from the Hawkesbury-Nepean catchment on this website. While the basin is considered unregulated, river flows within much of the catchment are heavily controlled by five major dams, as well as various major weirs which retain river flows. These storages include Warragamba, Mangrove Creek, Nepean, Lyell, Avon, Cataract and Cordeaux. The Hawkesbury-Nepean River system supports a $259 million agriculture industry. Major water users in this catchment include Sydney Water Corporation, local councils, the irrigated agriculture, tourism, fishing and oyster industries, and various recreational users. Sydney Water supplies water to most homes and businesses within the greater metropolitan area. While the natural flow of many rivers and streams in the Hawkesbury-Nepean River Basin has been significantly altered by water storages such as dams and weirs, the basin is considered an unregulated system. This is because the water storages do not regulate flows downstream – they do not capture and then release water into the river downstream for extraction by users. Most water storages in the basin are owned and operated by the Sydney Catchment Authority, so Sydney Water is able to supply homes and businesses in Greater Sydney with a reliable reticulated water supply. Significant alteration of the natural river flow, intensive urban and industrial development as well as numerous, competing needs for water are key water management challenges. water accounting: the NSW Government is rolling out water meters to licence holders to account for water extraction. The Hawkesbury-Nepean river is an important environmental asset. Dams and weirs in rivers affect the natural flow of water, water quality, fish migration and habitat. Environmental flows, or water released from a dam or weir, improve water quality, fish passage and habitat conditions. 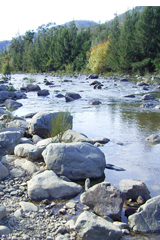 To enable new environmental flows to be released to the river, a $39 million upgrade was carried out on dams and weirs across the river. Modifications included new environmental release outlets and fishways. A flow scheme which began in July 2010, mimics the natural flows of the river, allowing more water to be released when it rains, and less when it's dry. The improvements are part of the NSW Government's Metropolitan Water Plan.